After all the celebrating with family during the holidays, along with visiting my good friend in the hospital since Thanksgiving, I lost my creative mojo. Yesterday and today, I finally sat down and created cards for Operation Write Home. Here is my "Miss You" card suitable for a young boy. I made several more of these with little girl and boy stickers. This card is precious and some little boy will love receiving it. Life forgets we like to have time to create, but we have to work around it. 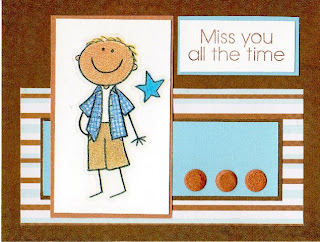 Glad you found time for this card - It's so sweet. My best wishes for your hospitalized friend. Happy New Year to you and your family.